Printed on 1" foam mattress (60"x 80") in two sessions, on one piece of foam. It is a monoprint. There is 1 other variation on fabric and 1 print on paper of this image. This is a cut-plate colour process; the matboard plates are cut apart, inked separately and then two large panels printed together; two plates for the bottom section and two for the top. 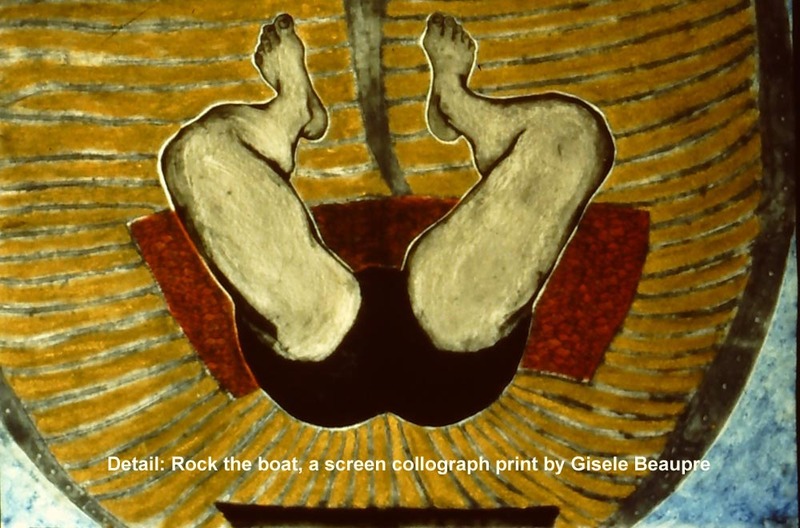 Chronologically, Rock the Boat is the third print in the Double Bind series. In the third chapter of this self-directed tale, a new figure (or the bottom half of the first). 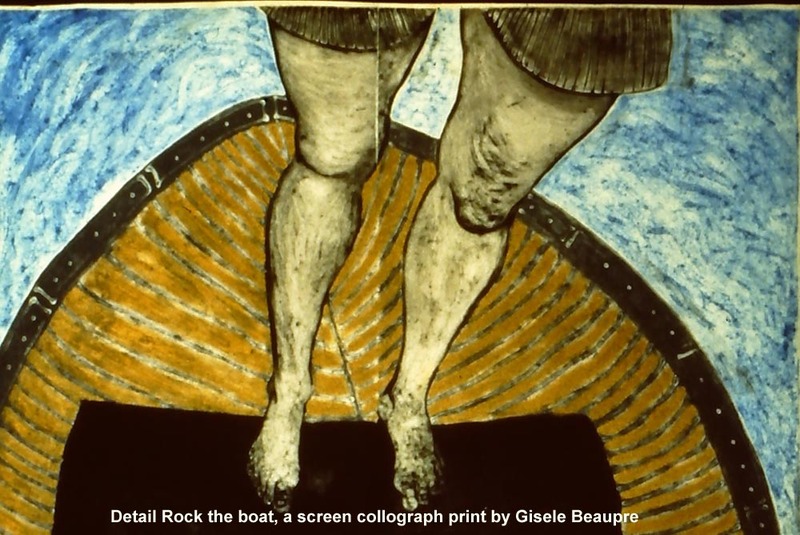 The new figure is jumping in the boat trying to disturb the equilibrium of the original sitter. 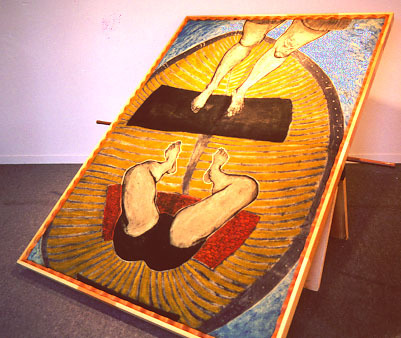 A wooden frame surrounds the print and a copper pipe is inserted into the two set-up carpetry horses to hold the frame and to create a see-saw kind of a scenario. This image vascilates between various dualities; of playful and harmful, good or bad, up and down, me and you and so on. Now I see the pun of the see-saw, as a metaphor of being caught up in what the senses see and interpret according to past memories or patterns of thinking. So some sense of equilibrium is seemingly destroyed here yet there is a constancy...the seat of the seer is still undisturbed. 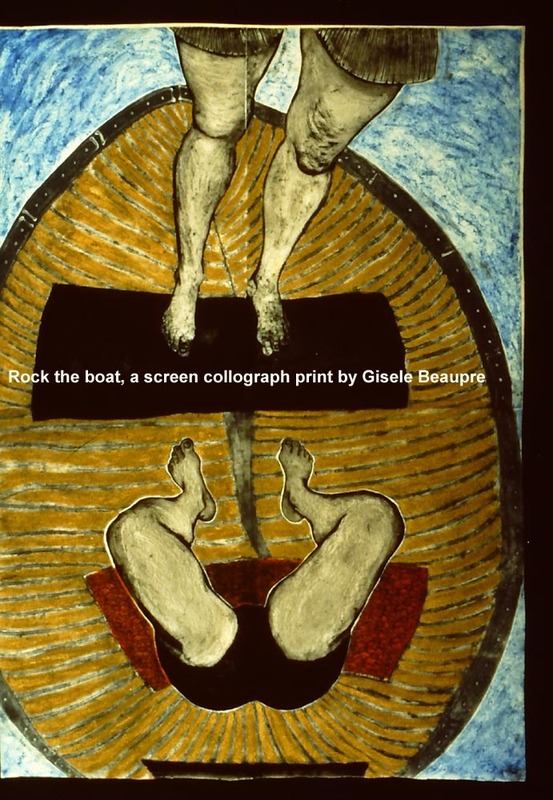 The blue water is printed and the rest of the colour is added by painting with acrylic. Yes, this print was a challenge to create. Thankfully, I had an assistant who helped me print all the plates. Her name was Susan Verres, at the time she was a recent graduate from the University of Manitoba.